Piñatas have a rich history that spans many different countries and cultures. Although piñatas are thought to have originated in China, today they are most strongly identified with Mexico, where the tradition can be traced back to the ancient Aztec culture. These days piñatas in the form of cartoon characters and superheroes are an essential part of any Mexican child’s birthday party, but piñatas are also an integral part of the December holiday season aka La Posadas. 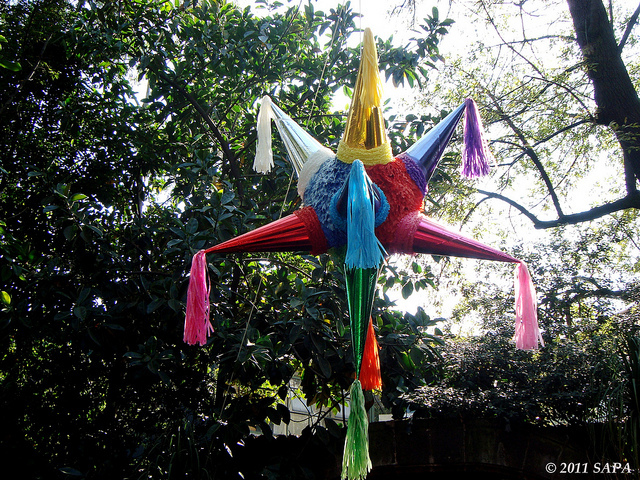 The traditional Christmas piñata is shaped like a seven-pointed star, or a ball with points. It has religious significance as each point represents one of the Seven Deadly Sins. The bright colors represent temptation while the blindfolded person represents blind faith and the stick represents the will to overcome sin. A broken piñata represents victory against evil. Although birthday piñatas are generally filled with modern candy and small toys, Christmas piñatas contain fruit and traditional Mexican candy, which represent divine rewards. These days much of the time the person hitting the piñata is not blindfolded, especially if it’s a child. A special song is repeatedly sung while each person takes their turn. Once made of a clay pots, modern piñatas have mostly been replaced by those made with cardboard and paper mache. Beyond the origins and religious meaning of the piñata, the true beauty of this tradition is in the smiles it brings to the faces of all who participate in it.